So far in the last year or so, I’ve put matcha in a pound cake, in a batch of scones, and even into one of my favorite/most popular smoothies and all signs point to my matcha love not stopping anytime soon. 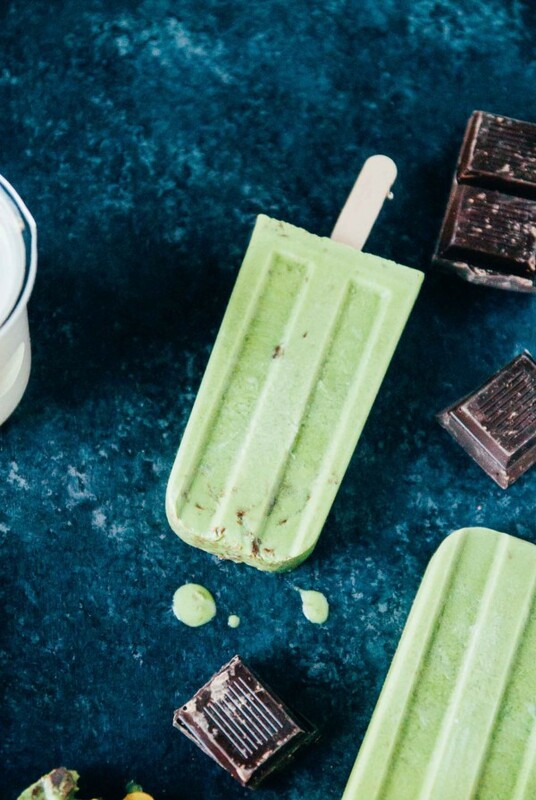 When I was brainstorming more around summertime recipes, I knew popsicles were going to be a given, seeing as they’ve always been popular around this space (especially if they are of the boozy variety). 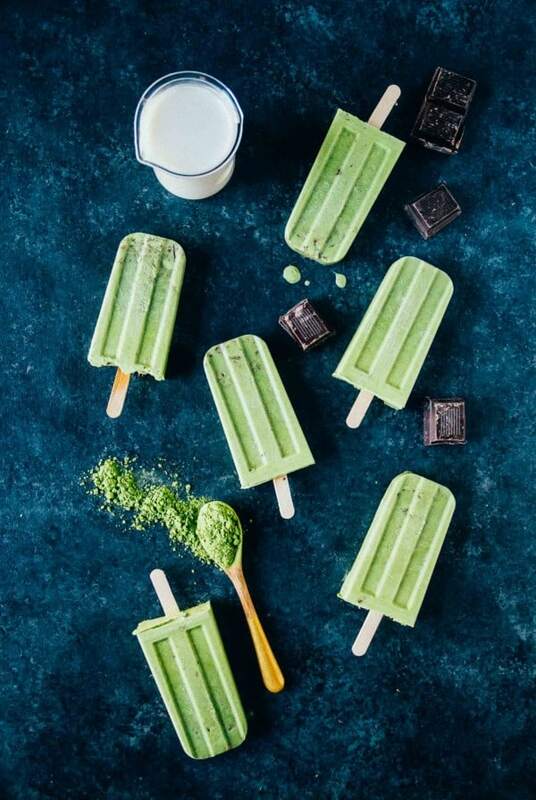 I figured that I might as well just combine my love for matcha lattes with chocolate and popsicles, resulting in a batch of maybe my favorite popsicles yet, matcha popsicles! 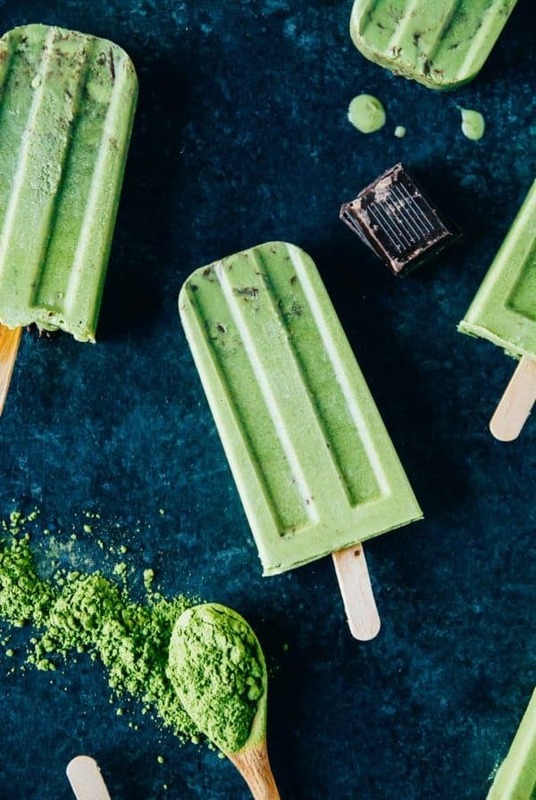 If you’re already a matcha lover like me, these are going to be right up your summertime treat alley, but if you aren’t quite sold yet on the delicious properties of matcha, these are also the perfect place to start. I know to some, matcha still has a grassy, harsh flavor that takes some getting used to. I remember the first time I ordered a matcha latte (I had no idea what I was getting, I just thought it sounded cool), I took the first sip of it and thought, ‘Um why does this taste so green?!’. Duh, Abby, because it’s green tea, obviously. While I wasn’t a fan at first, over time I figured out that adding a bit of sweetener and a blending it with a fair amount of almond or coconut milk gives it a perfectly creamy texture, resulting in a slightly sweet, creamy matcha latte that has just the right amount of caffeine for someone like me. 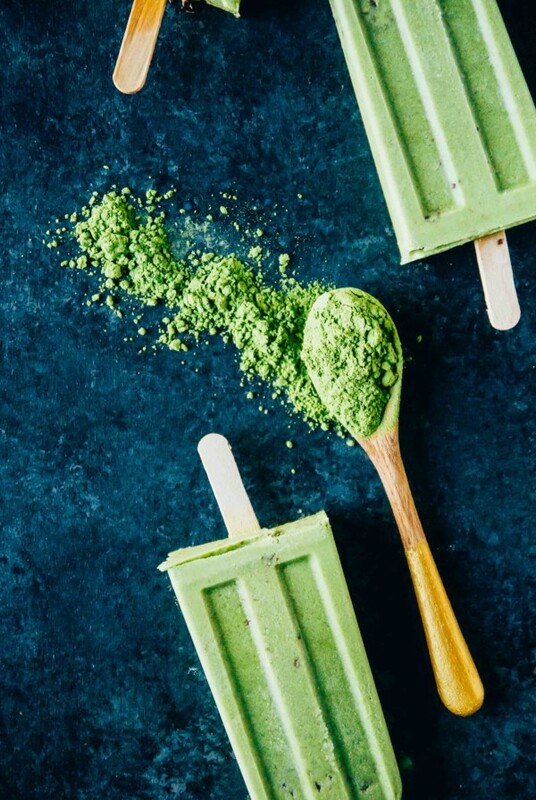 Naturally, after I’ve taken this matcha latte love and run with it, matcha popsicles were bound to happen. 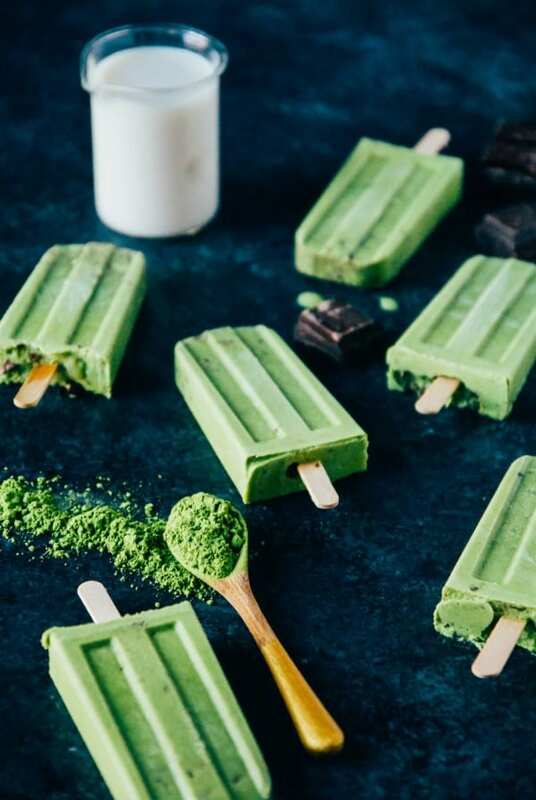 One of the best things about these matcha popsicles is the dark chocolate chunks that sink to the bottom, so after they are frozen and unmolded, the first bites consist of a LOT of chocolate and gradually fade into a frozen matcha latte-like popsicle. To me, it seems like the best of both worlds! I always get questions about the popsicle mold I use when I post popsicle recipes, so this one is the one I have and love. When I was searching around for a popsicle mold a few years ago, I found it difficult to find one that was not part of a popsicle making freezer mold and also one that had individual popsicle molds that pop out. This one has withstood many popsicle recipes, including a few that have gotten frozen in there pretty good, so I give it a solid stamp of approval. It also comes with lots of popsicles sticks, so I haven’t had to restock yet! I hope your weekend is filled with lots of downtime and maybe some time in the sunshine too! I’m going to a baseball game with my food loving friend Jordan and have a new bagel recipe to test and bring to you next week. I’m also starting a fun series on Sunday, so stay tuned for a new post in a couple of days. Happy Friday! I’ve fallen in love with ice pops after coming back from Colombia, where they are everywhere. Feeling inspired! They are so easy and delicious! OMGgg I love Match Popsicles, Abby and this one is right up my alley! I’ve been using dates to sweeten and whippin it all up in the vitamix. But I love the addition of maple, especially with a bit of chocolate. This could be breakfast! Ohh I love the sound of your popsicles Traci! I think you would love these!